This styled shoot has been a long time coming and I’m so excited to be sharing part of it today! This summer the talented Mary Beth Smith, at Magnolia Blooms, and I decided that we wanted to collaborate together to organize a styled shoot. Over the next couple of months we worked on putting together an amazing team to come together and make this session happen! This was our first styled shoot and it was quite the learning experience. We opted to keep it simple and therefore did not require a wedding planner or venue. Although this did keep it more simple, it also meant that we had to take on the role of planner. Which meant finding vendors, coordinating schedules, dates, times, dress fittings, locations, style, colors and all the little details you usually do not have to worry about like colors of ties, and types of jewelry. Despite all of that, everything came together so well and we are super happy with how it all turned out. We had two wonderful couples model for us. This post shows off the lovely real life couple, Lori and Daren. We will have another blog post soon with our other beautiful couple so watch for that. 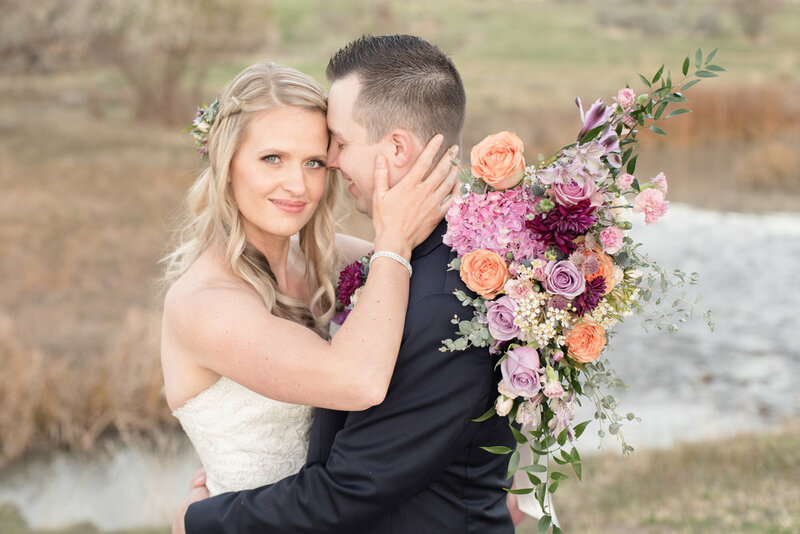 For now, enjoy these two in their gorgeous wedding attire and their amazing floral arrangement!